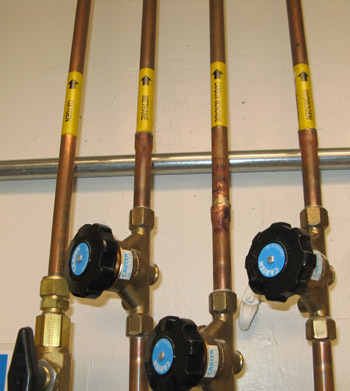 Minimize leaks through the use of welded joints where possible. Ensure that personnel will be able to easily reach joints and fittings (to check for leaks). Prevent or reduce the chance of personal injury (i.e., contact with cold surfaces, head impact, tripping hazards, etc.). Minimize stresses (structural and thermal) in piping components and connected equipment. Determine proper sizes and settings of pressure relief devices. Include properly labeled shutoff valves at safe locations. Flow restrictors, such as orifice meters, in the supply line are an effective means of limiting the supply flow rate and controlling leakage rate. Piping should be labeled to indicate content, flow direction, and design and test pressures.